Last night as I was going to bed late after a challenging day. My dad who just had a mild heart attack called me to warn me of a Tsunami Watch. Yesterday like many other days the electricity and the internet went out in Puerto Rico caused by the aftermath of Hurricane Maria created in an already fragile infrastructure. Seconds before my dad called, I had seen an alert from Puerto Rico's #1 Weather expert Ada Monzon. I talked with Dad and did my best to calm him down. After having an episode like the one he had days before, my job was making sure I got more information on what was going on with the warning. Once I had viable information, I could quickly decide what the next steps were going to be for the family. But I have to be honest that surviving Hurricane Maria has left me with a bit of PTSD. Every time I hear anything related to storms, tsunamis, or any other natural disaster, I remember the scariest day in my life. I jumped onto Facebook were Ada was doing a Facebook Live. She was letting us know that we needed to remain calm because the Watch was very different from a Warning. Total Evacuation. Run for high Ground and follow emergency instructions. Remain away from the coast and stay tuned for local emergency guidance. No warning, advisory, or watch is issued. A distant ocean basin may be in danger. How much do I know about a Tsunami? Many questions came to mind. One thing I learned about Maria is that once communications go down and we have little access to news, not understanding events can make the situation scarier. So I decided to go and research a bit more about tsunamis and get a better understanding of what it is and how it can affect me. It's the best way to be prepared before a situation happens. A tsunami is a series of waves generated in an ocean or other body of water by a disturbance such as an earthquake, landslide, volcanic eruption, or meteorite impact. 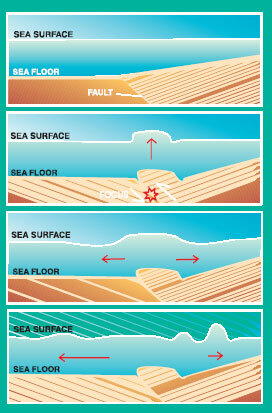 The picture at the left shows how an earthquake can generate a tsunami in the overlying water. The difference between a tsunami "watch" and "warning"
As I watched Ada Monzon's Facebook Live video I quickly understood there is a difference between a Warning and Watch. What I learned doing some more research is that a Watch is initiated immediately once an Earthquake is larger than 7.5 or even 7.0 in areas like the Aleutian Islands. The effects of Hurricane Maria on Preparedness and Stressing out More than we need to. Once I had a better understanding of what I had to do for the Tsunami Watch, I went online and did my best to inform the people I have connections with on Facebook. One thing I noticed was many of my friends and contacts on the Island were sharing how stressful it became as soon as they got the alert. The fact that everyone wants to create awareness and keep people alert can become an issue. The lack of Power and Internet Makes it scarier. I have a friend who is still without power and her cellphone service in one of the Major cities is not reliable. So the fact that she received an alert and could not watch the videos explaining what was happening, created a higher level of stress than necessary. Everyone wants to break the news nowadays. But on an Island like Puerto Rico not having access to power or reliable internet can cause us to suffer from getting only part of the information. Having said that, I remember days after Hurricane Maria when they initiated a Flood Warning. I had to text friends and family on the outside (the only way I could communicate) to see if it affected me. Once communication went down all the information and updates I received trickled in slowly via SMS text. So next time you decide to share a video for an emergency zone keep in mind that text can be read quickly and can probably help the person take the most appropriate action. But sharing video in a zone with slow or no internet connection can create a bigger issue. Do the extra work and once you have an understanding of the alert, warning or threat include some text. Be as brief as possible but also important additional details. Learn as much as you can about what natural disaster or events can affect you. Prepare yourself as best as you can and keep improving your current emergency plans. Here are a few more videos to Learn about Tsunami safety protocols.